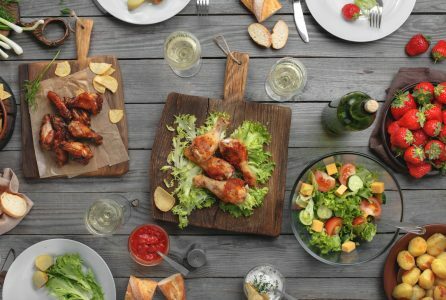 If you have resolved to eat healthier to manage your diabetes, blood pressure, or cholesterol, super bowl parties can present a challenge. It’s important to have a game plan before tackling the Super Bowl spread, UT Southwestern Medical Center dieticians say. “Remember that healthy-food choices and controlling portions are key to good health,” says Dr. Jo Ann Carson, a registered dietitian nutritionist at UT Southwestern. If you’re hosting a party, include healthy options such as salad, fruits and vegetables. Low-calorie and sugar-free selections can help diabetic friends and family control calories and carbohydrates and make sound choices without much fuss. “For people with diabetes the goal is to keep the carbohydrates down — and encourage more of the protein-rich foods — to enhance satiety,” Carson said. She also coaches her patients to eat slowly, so that they consume a limited amount per quarter, and to get up and walk around during each commercial break to encourage activity as well as better eating habits. If you’re a party guest trying to keep control of your diabetes, find out what’s on tap for the Super Bowl party you’re attending. If it’s shaping up to be a high-carb feast, bring some of your own favorite dishes, or coordinate with others with diabetes to ensure the table includes healthier options. It is also important to monitor blood sugar on a regular basis. If blood pressure is more of a concern for you, load up on fruits and veggies that provide potassium and limit your sodium by avoiding salty snacks, dips, and sauces. UT Southwestern integrates pioneering biomedical research with clinical care and education. The institution’s faculty has received six Nobel Prizes, and includes 22 members of the National Academy of Sciences, 17 members of the National Academy of Medicine, and 15 Howard Hughes Medical Institute Investigators. ← Does Massachusetts Governor Have An Elder Agenda?